Sowing cacti and succulents is hugely rewarding and for me, at least, one of the best parts of the hobby. 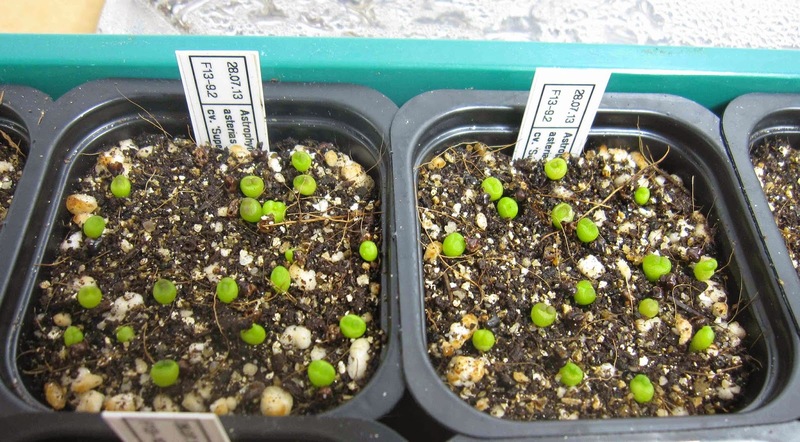 Not only is it a dramatically cheaper way to increase your collection than buying adult plants, it also allows you to follow and study their development from tiny seedlings with just two cotyledons to their name all the way up to maturity and flowering. And there is, of course, always the chance with raising seeds that you’ll get some interesting mutants. It’s always a good feeling when you see the first little seedlings appear after sowing, and always a disappointment when they fail to do so. Sometimes you may know what the likeliest cause of their failing to germinate is, but most often you’re left guessing. And not rarely you’re left second-guessing yourself. It’s easy to assume that you yourself must have done something wrong – which certainly may be the case – but I believe that just as often the fault may simply lie with the seeds themselves. On the part of the nursery or supplier, the seed quality will be affected by such things as how old they are, how they have been stored, whether or not they have properly matured, and whether or not the parents are genetically very similar or not (i.e. inbreeding over a long period of time can yield poorer quality seeds). On the part of the expecting grower, seed quality will be affected mainly by storage. Seeds should be kept at relatively cool temperatures in a dry atmosphere. I believe temperatures between 4-8 C is ideal, although such temperatures coupled with a dry atmosphere is not so easy to achieve. The seeds also do not like large temperature variations during storage. I have not run any experiments with storage of seeds couple with germination rates, but according to various books and scientific papers the above conditions are apparently the best way to store the seeds. Generally this will keep their viability for at least 2-3 years, though some seeds will keep for considerably longer. 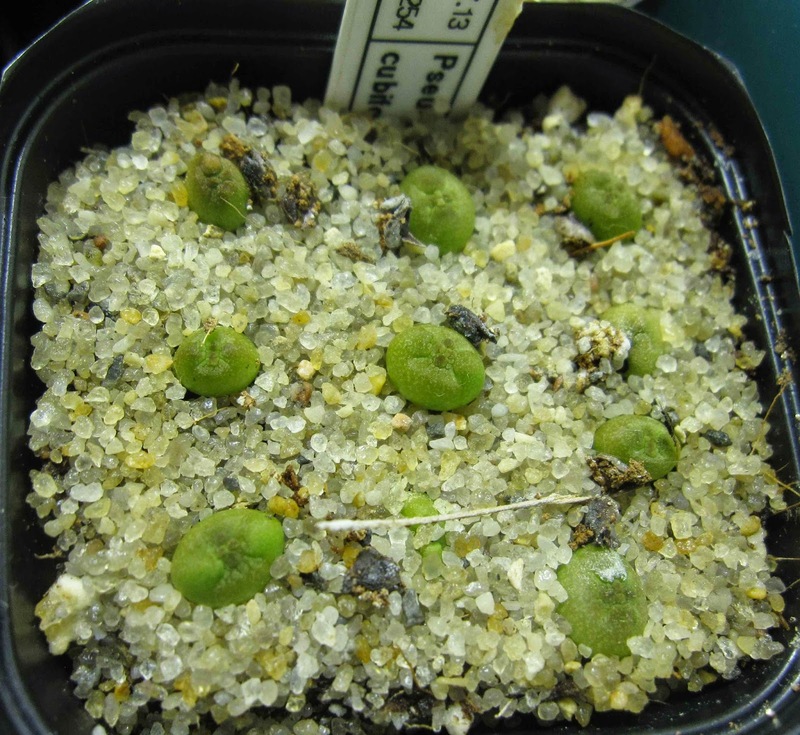 One and a half weeks after sowing, 100 % germination in Pseudolithos cubiformis shows excellent seed quality. Such high germination rates are the exception rather than the rule with seeds bought from nurseries. 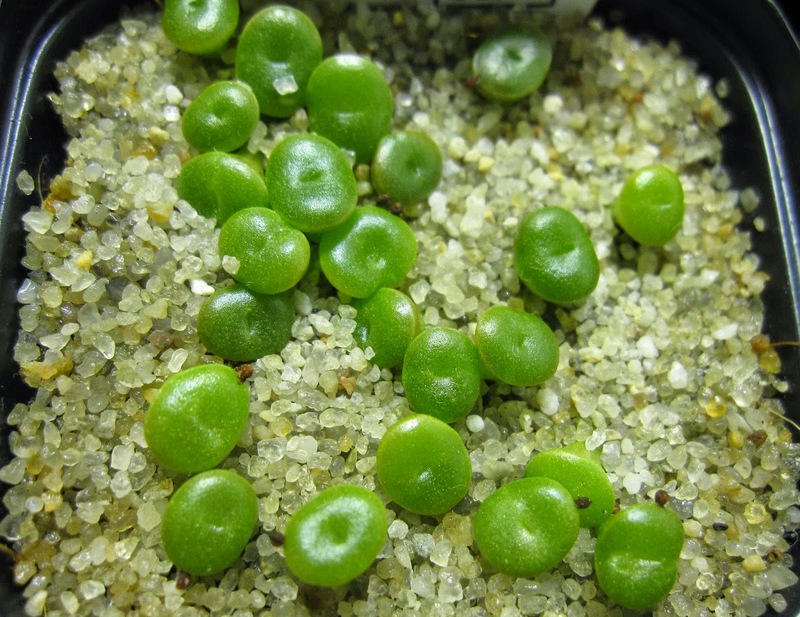 The same Pseudolithos cubiformis one month after sowing. In general, species with tiny seeds (like Strombocactus) will not keep for too long. After 12-18 months or so their viability is not great in my experience. On the other hand, species with big seeds (like Sclerocactus) tend to stay viable for a long time. I would not be surprised to see certain of these species have excellent germination rates even after five years of storage. Anyone who has sown home-produced seeds will know that they generally germinate very well, whereas nursery-bought seeds may have anywhere from 0-100 % germination. I believe the main cause of this is the age of the seeds. In general, the sooner you sow after the seeds have matured, the better germination rates you’ll get. There are some exceptions to this though – certain species germinate better after the seeds have matured for some time (months to years). The main faults for seeds failing to germinate that can be pinned on the grower is too high or too low temperatures, too much or too little light, or too much or too little moisture. Seeds will usually germinate best with temperatures between 18-35 C. It varies somewhat from species to species what they prefer, but in general a temperature range of 20-28 C should be ideal for most species. A variation of temperatures between day and night is also beneficial for germination. The best source of heat according to a lot of experts is bottom heating, but this is definitely not required and personally I do not have bottom heating. Temperatures above 35 C will progressively lead to reduced germination rates. Some North American genera will benefit from bigger day-night temperature variations, in particular the likes of Sclerocactus and Pediocactus. One and a half weeks after sowing most species have started germinating, and some are more or less done. In this tray Adenium, Plumeria and Welwitschia germinated very well. Some other species in this tray did not, such as Metasequoia and Sequoiadendron. As can be seen from the thermometer temperatures reach 35 C under the plastic lid, and while some species may find this just right to germinate quickly, others may find it too hot. I’m not certain that’s why these two species in particular did not germinate but I think it’s likely. Some species germinate better with more light, while others seem to not really care either way. Some light is certainly needed, but seeds should be shielded from direct sunlight. Except with the tiniest of seeds I always push the seeds slightly into the soil or even cover the largest seeds with a little soil. Light is a requirement, but you certainly don’t have to provide the levels of light an adult plant needs. Moisture needs to be high, but not too high. Some seeds will germinate even if the soil is completely saturated with water, but for most I believe this will only act as an inhibitor to germinating. The obvious problem with too little moisture is that the topmost soil of the pot can dry out and then the seeds won’t germinate. With too much moisture you risk the seeds not germinating at all, but you will also get increased algae growth and be more exposed to fungal attacks. After you’ve watered the pots, it’s a good idea to allow them to drain off any excess water by placing the pots on tissue paper or news paper for some time. To know the right level of moisture takes experience, and even with plenty of experience it’s easy to get it wrong. Pots and trays are the normal types of container for sowing. Pots can generally be any size you like, but the most common sizes are 5-8 cm in diameter pots. You can use smaller or larger pots as you please, but with smaller pots you have to consider that the soil will dry out more quickly and vice versa. 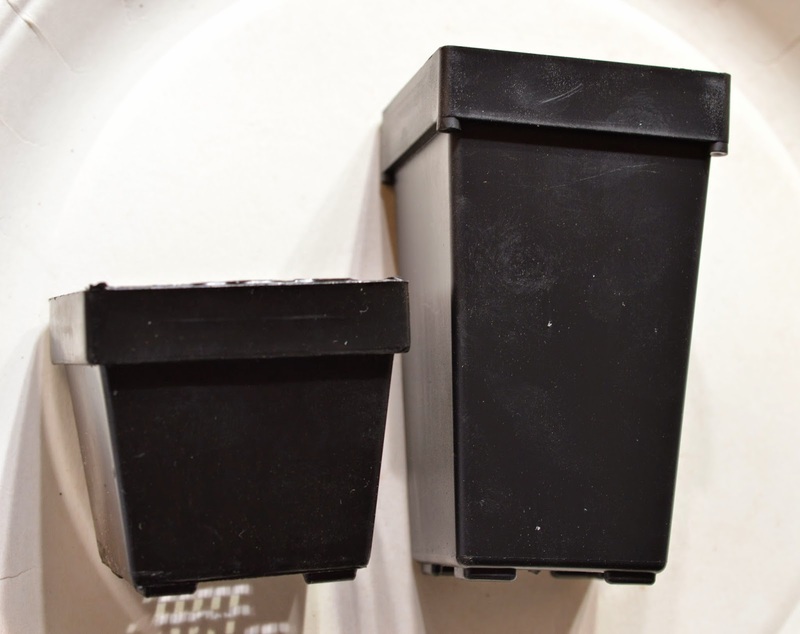 Personally I most often use 5 cm square pots because they fit very snugly in the trays I use to keep them in. When I started up last year I used 6-7 cm pots to sow in and I have to say that it is perhaps a better size. The larger volume of soil in these bigger and slightly deeper pots allow the seedlings more space to spread their roots and the soil does not dry out as quickly as in the smaller 5 cm pots. It certainly seemed to me that they grew faster in these larger pots than later seedlings have done in the same soil mixes and environmental conditions, but in smaller pots. Alas, I am constrained by the space available to me, and though simple logic would suggest I sow less but in bigger pots, I seem unable to follow it. For the species that develop thick and deep tuberous roots, it might also be beneficial to sow directly in deep pots. This will allow them to develop their root systems without hitting the bottom of the pot too soon, as they’re likely to do with shallower pots. It’s not really a big problem but I think they might develop better if their roots are allowed to stretch properly. After all, for many of these species their tuber(s) may be significantly bigger than the plant body itself and they invest a considerable amount of energy developing them. Members of the genus Ariocarpus usually spend the first year or two almost solely focusing on developing their tuberous root system. species with tuberous roots. The pots can be bought from www.kakteen-haage.de. It is also possible to skip pots altogether and sow directly in trays. The advantage with this is, like with bigger pots, that the seedlings are afforded more lebensraum and thus likely to grow faster. The downside with trays is first of all that it is easy to keep the soil too moist once the seedlings are a few months old and starts preferring slightly less moist conditions. The increased amount of soil often leads to a much larger root system too, which may be a bonus, but when you’re short of space problems can arise once you decide to prickle the little seedlings out of the tray and into pots, only to discover that the plants have such large root systems that they all need a pot of their own. 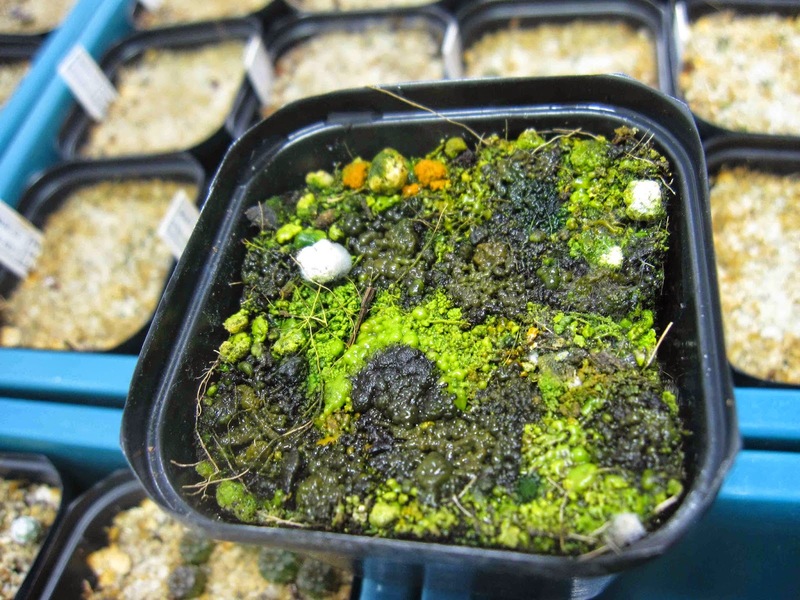 Another disadvantage with trays is that if you happen to sow seeds of species with drastically different growth rates in the same tray you may find one species completely out-competing the other. Finally, if a fungal attack occurs in a tray it will spread much faster from plant to plant than it will if your seedlings are sown in pots – then you can just remove the affected pot(s). It is a less time-consuming way of sowing though, if that is a concern. And also, if you wish to sow hundreds or thousands of seeds of the same species it is probably the best way to do so. I suppose it is possible to sow seeds without any cover and have them germinate fine, but then you’d probably have to constantly spray the surface of the soil to keep it evenly moist. By far the better solution is place the pots (or trays) in an enclosed atmosphere. This is usually accomplished by way of placing the pots in a tray and cover the tray with a sheet of plastic or glass, or a plastic roof (like the mini-greenhouses you can find in most garden centres). Another method is to place the pots inside a plastic bag or even sow directly in a glass jar that can be sealed afterwards. A mini greenhouse on the left with sliders on the top to regulate ventilation. On the right is a tray with lots of plastic bags with three pots in each. For most species it is sufficient to use a tray with a plastic or glass cover. 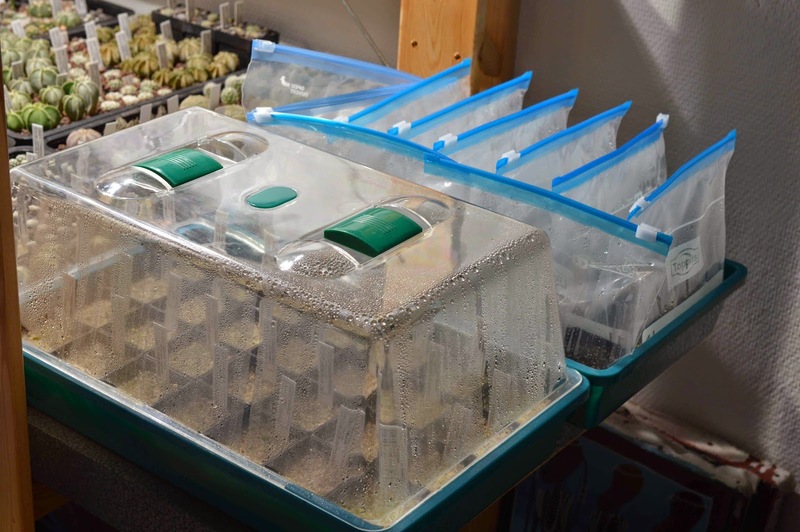 It is better if the cover is not flat because then the condensation inside the tray will often form large drops on the underside of the plastic/glass directly above the seedlings, ready to drop like a bomb and unsettle and maybe kill them. A way to know if the moisture level in the soil you have used is about right is to look at the kind of condensation that forms. If the condensation is fine the moisture levels are probably good, whereas if large drops keep forming it may be too moist. If very little condensation forms it may be that it’s slightly on the dry side. Placing the pots in plastic bags is known as the “baggie-method”. The principal reason for using this method is that with a sealed plastic bag you can keep a humid atmosphere for months or years. Most species of cacti and succulents don’t need this, but some of the slowest growing cacti can benefit from this method. 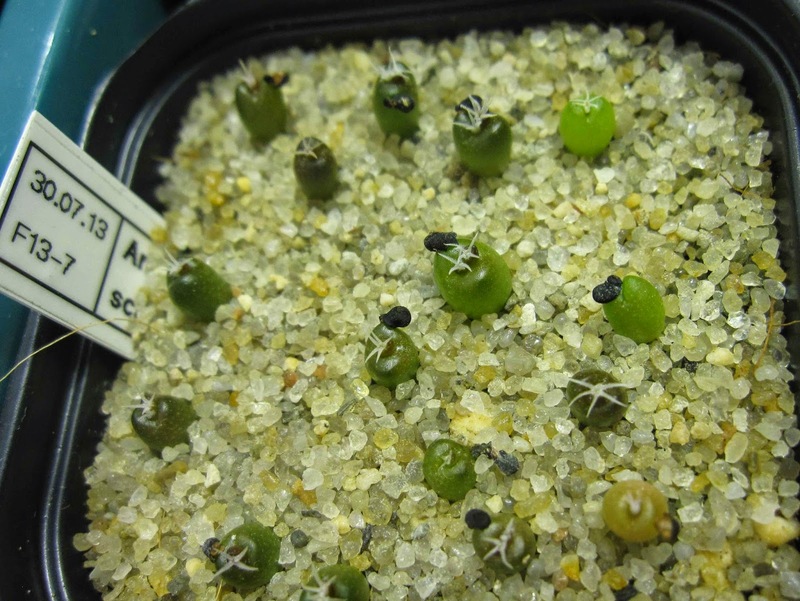 In particular the genera Aztekium, Blossfeldia, and Strombocactus are very slow growing from seed (and Aztekium ritteri may be the slowest growing cacti of all), and since they grow better during the seedling stage with constant high moisture levels the “baggie-method” is the easiest way to achieve this. Using plastic bags is also a way to keep pots with and without fungal attacks separate from each other. If you’re only sowing a few species it is also a way to keep them without needing a whole tray to put them in. I use standard zip-lock bags that are just big enough to fit three 5 cm square pots. of fungi and algae, the pots can stay in the bag for a year or more (if desirable). 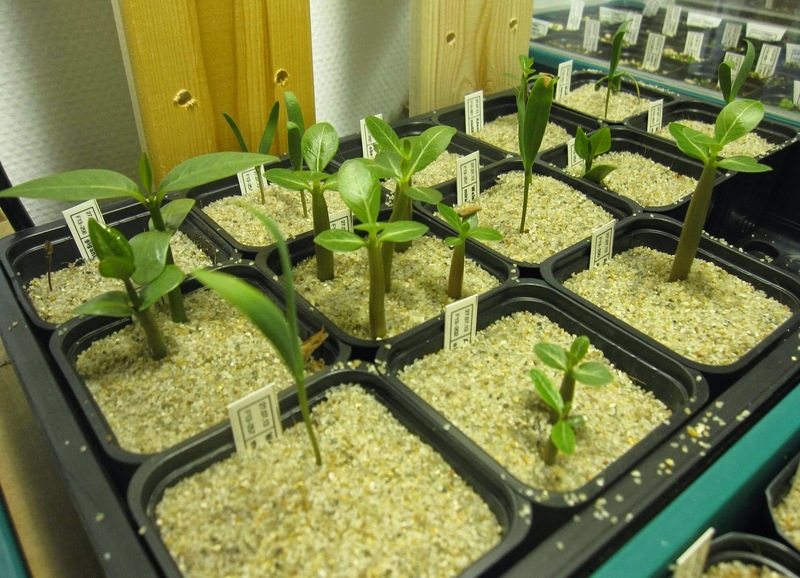 Depending on the species the seedlings may enjoy such humid conditions for weeks, months or even years, but sometimes they want to breath fresh air very soon after germinating. Which species prefers what comes somewhat with experience, but in general I have found that the bigger-seeded the species the shorter time it likes to stay in an enclosed atmosphere, and the other way round the smaller the seeds. It is a rule with exceptions though! Genera such as Astrophytum and Frailea have big seeds, but have no trouble staying inside an enclosed atmosphere for weeks. If the seedlings start dying it is usually a clear sign that it’s high time to let them out. Otherwise I’d aim at letting them out once they’ve grown a good bit – again this comes with experience, but usually I start exposing them to fresh air after a month or maybe two in some cases. Keep in mind that even the closest kept bag (and certainly the mini-greenhouses) let out some air – they’re not exactly hermetically sealed. When it’s time to start exposing the seedlings to fresh and drier air, it should be done in stages. If they are moved straight from a very humid atmosphere straight into open and dry conditions they may have their growth severely checked by the shock. Exposing them slowly over a period of days or weeks is the way to go. the enclosed atmosphere and exposed to natural air and humidity levels. removed from the mini-greenhouse so as not to shock them. What’s that growing in my pot? Fungal attacks and algae growth happens to everyone, though it’s possible to avoid both. The less clean your conditions are during sowing and the more humid the atmosphere the pots are kept in, the more likely it is that your pots will be visited by all manner of fungi and algae. The main danger of the two is clearly fungi, as a fungal attack can easily wipe out every seedling in a pot in a matter of days. Algae are not immediately as dangerous, but some types will cover the entire soil surface – seedlings included – and slowly suffocate or starve them (at least that’s what I believe happens). If your seedlings grow fast enough they are likely to out-compete the algae, but for species such as Blossfeldia this is not likely. not really a problem though. Apart from using fungicide to kill the fungi, the best way to treat pots heavily affected by either is to remove them from the enclosed atmosphere and expose them to drier air. You risk your seedlings being disgruntled and have them stop growing, but if the alternative is certain death there is little choice. Keeping clean conditions and ensuring that the seeds are not sown with fruit remains still attached goes a long way to reducing the risk of fungal attacks. interesting and colourful at least. It takes some time for such an extreme case to develop though. see what would happen. The image is taken three months after sowing. To avoid the problem altogether you need to sterilise all your equipment and sowing medium and also have a tiny bit of luck. Equipment (i.e. pots and labels) can be sterilised in the microwave oven if they don’t melt, or washed with bleach or some similar disinfectant. Soil (the organic part) can be cooked in the microwave oven for at least three minutes at the highest setting, or baked in a regular oven for much longer. If baked in an oven it must not stay for too long though, or dangerous chemicals will be released in the soil by its components that are very likely to be very harmful to little seedlings. In the microwave I suppose the same can happen if it stays for too long. A possible harmful side-effect of sterilising soil this way is that with all the bacteria dead you don’t know what kind of bacteria will re-establish in the soil. It may be a beneficial bacterial flora, but it may also be that your soil is suddenly swarming with harmful bacteria. anything remotely close to the colourful image above. If everything is done correctly and meticulously you should in theory be able to keep your pots in a plastic bag for a year or more without any fungi or algae spreading. I’ve only attempted to do this once, a few years ago. I was not very successful, though I do not know whether I wasn’t diligent enough in the sterilising process or simply unlucky. In any case the end result was not particularly positive with tiny seedlings dropping dead within days after germinating. Scarification and stratification are methods to treat seeds that otherwise germinate only with much difficulty, or not at all. Scarification involves reducing the strength and impermeability of the seed coat to allow water and oxygen to reach the embryo – without which it will not germinate. In many species the seeds are designed to move through the stomach and intestines of animals and be worn down by this acidic environment. In others the seeds are designed to be mechanically worn by travelling in water and being abraded by sand and gravel. Still others may be softened or outright crack from very high or very low temperatures (usually over some length of time). Large seeds in particular often need some form of treatment, although this, again, is not a rule without many exceptions. Large seeds in terms of cacti usually means 2 mm or more in diameter. Stratification is a method designed to activate certain chemicals inside the seed which in turn gives the signal to the embryo to start germinating. This also involves temperature. The most common form (and to my knowledge the only one relevant to cacti) is cold stratification. With this method seeds are exposed to cold temperatures and moisture and/or natural light for certain lengths of time, sometimes with shorter and slightly warmer spells in between to mimic natural cycles of warmer and colder weather. After a certain length of time, or a certain amount of cycles, exposed to cold temperatures and moisture the seeds are ready to be exposed to warmer temperatures and more sunlight in the hope they’ll germinate. If not, they may need further treatment. I have never tried stratification, though I know certain growers use this method when sowing Sclerocactus and Pediocactus in particular. I have tried three different methods of scarification, two of which have been very successful. The first method, and the one I’ve tried the least, is to expose seeds to very high temperatures over a length of time. I collected some Baobab seeds (Adansonia digitata) some years ago in Tanzania, which are fairly large and have a hard seed coat. To treat these I boiled water and immediately after the water began boiling I poured it in a bowl an placed the seeds in the water. I let them stay in it for 12 hours and sowed immediately afterwards. 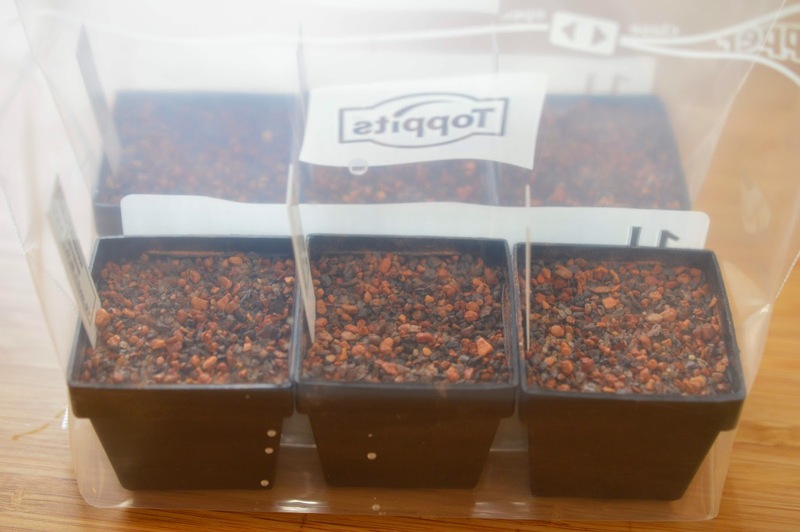 With this method for Baobab seeds I generally have a 70-90 % germination rate, though I should mention that I’ve never tried sowing these seeds without treating them. The second method I’ve tried is to soak seeds in a mixture of water and bleach (probably around 50:50 or 60:40 with least bleach). I have tried different lengths of time, from 3-15 minutes, but I can’t say I’ve seen any noticeable results. I suspect some seeds will have germinated better while others will have been unaffected, and some will probably have died from the treatment. I think it’s difficult to get the amount of bleach right (or any other acid you may decide upon). The correct amount to mix with water and particularly for how long to soak the seeds must surely vary from species to species, so I think this method may be more useful as a way to disinfect seeds (but then soaking them for only a very short time). The third method I’ve tried is to chip part of the seed coat away using a needle. For this method to work you need good light, a steady hand, a pair of tweezers and seeds that are at least 1,5 mm in diameter (otherwise they’re just too small to work with). Basically you hold the seed with tweezers or your fingers, and press the needle down on the seed in such a way that a small part of the seed coat chips away. It takes a bit of practice and some seeds are designed in such a way that it is very difficult or impossible to find a suitable place to try and chip it. The best area to chip is slightly past the micropyle. This area is easy to find on some seeds and very difficult on others. If you can find it and chip at the right place and angle you will generally have good results, though you risk killing the embryo if you get it wrong. Personally I’ve had a lot of success using this method on Pediocactus, Sclerocactus, and the difficult Echinocactus species. I’ve had germination rates of up to 90 % with this method. Pediocactus peeblesianus var. fickeisenii nine days after sowing (this was sown in a completely inorganic soil). This species is one of those known to be difficult to germinate but after having chipped the seeds 90 % of them have germinated. In the lower right corner can be seen the twin seed I mentioned in Part 3 of this series. Two embryos have germinated from the seed. Sadly, this seedling left for the great desert in the sky a month or so after germinating, so I don’t know whether it was a Siamese twin conjoined at the hip or whether there was actually two embryos with separate root systems. Another way to manually scar the seed coat is to abrade it with sandpaper or a nail file, though I haven’t personally tried this method yet. When the area of the seed coat that you’re abrading changes colour it means you’ve almost penetrated it. This should be enough for water and oxygen to penetrate the seed coat and start the germination process. In all methods of scarification the seeds should be sown immediately. If not the seed will most likely die. 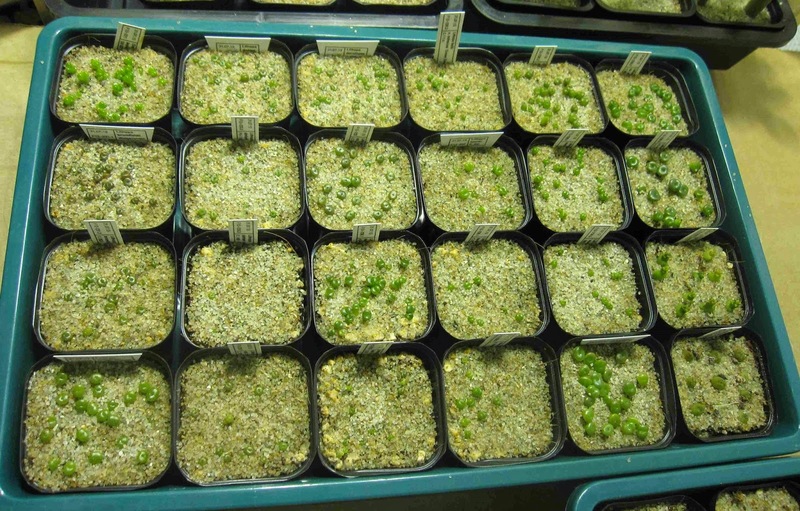 The time it takes for seeds to start germinating varies a lot from species to species. 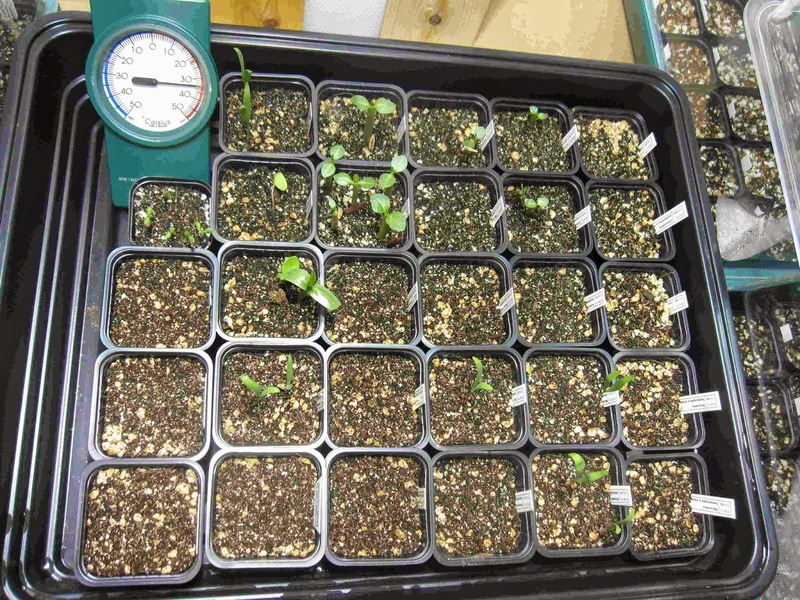 Most species will have started germinating after about 7 days, and be more or less done after 21 days. Some will begin sprouting after only two or three days, some will need two or three week before germinating, while a few may take several weeks or even months to germinate. 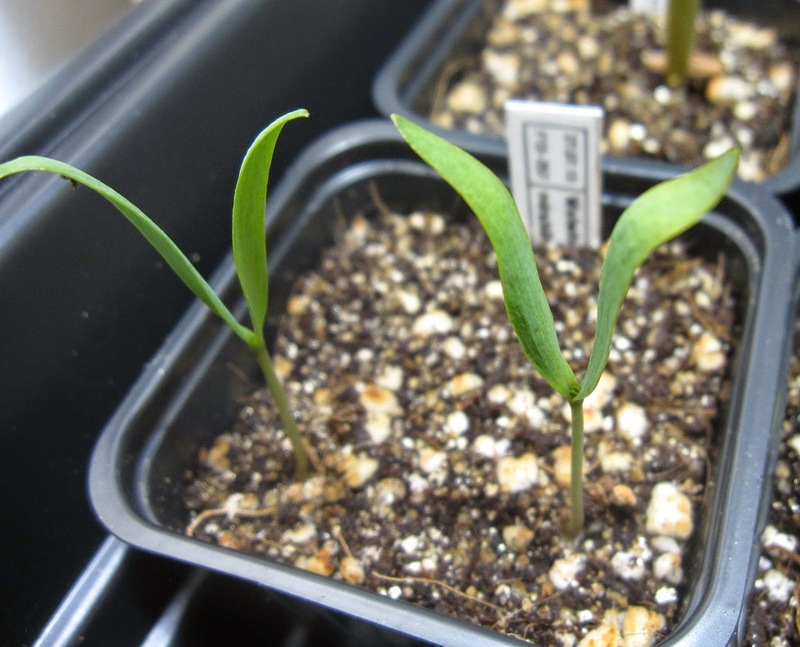 The species that sometimes take very long to germinate generally (if not always) have large seeds. If no seeds in a particular pot has germinated after four weeks (and you’re pretty sure they should have in that time) it’s possible to remove the pot and let it dry out somewhere not exposed to sunlight, and try again to have the seeds germinate after a few months. It’s also possible to remove the seeds from the pot and store them somewhere suitable and try again to sow them at a later date. One and a half weeks after sowing, Welwitschia is growing well. this genus germinate readily and grow quickly. I sowed seeds of a few species of Pediocactus, Sclerocactus and Echinocactus in 2011 that failed to germinate. The pots were left dried out on the bottom shelf in the greenhouse for almost a year before I removed the seeds. I did not store them in the best of conditions and had little hope for them when I sowed them again earlier this year. However, I did scarify them with the chipping method described above, and lo and behold 50-80 % of the seeds germinated! This not only shows how effective scarifying can be, but also the longevity of seeds. Germination rates vary tremendously from genera to genera and species to species. All the important factors affecting germination rates have been described in the above paragraphs and any one of them may have a big effect. All in all I expect an average germination rate of 50 % on cacti seeds from professional nurseries. The germination rates vary wildly though. Sometimes some species will not germinate at all while a related species will pop up eagerly in the neighbouring pot. A tray (mostly) full of Lithops one month after sowing. I’d never sown seeds of this genus before, but they germinated very well. 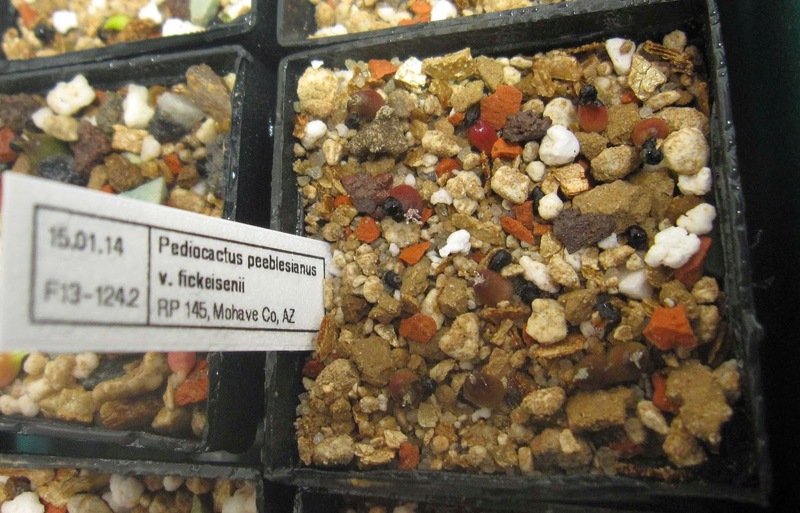 As with most Mesembs the seeds are very tiny, and it seems it remains true with both Mesembs and cacti that species with small seeds usually germinate readily. 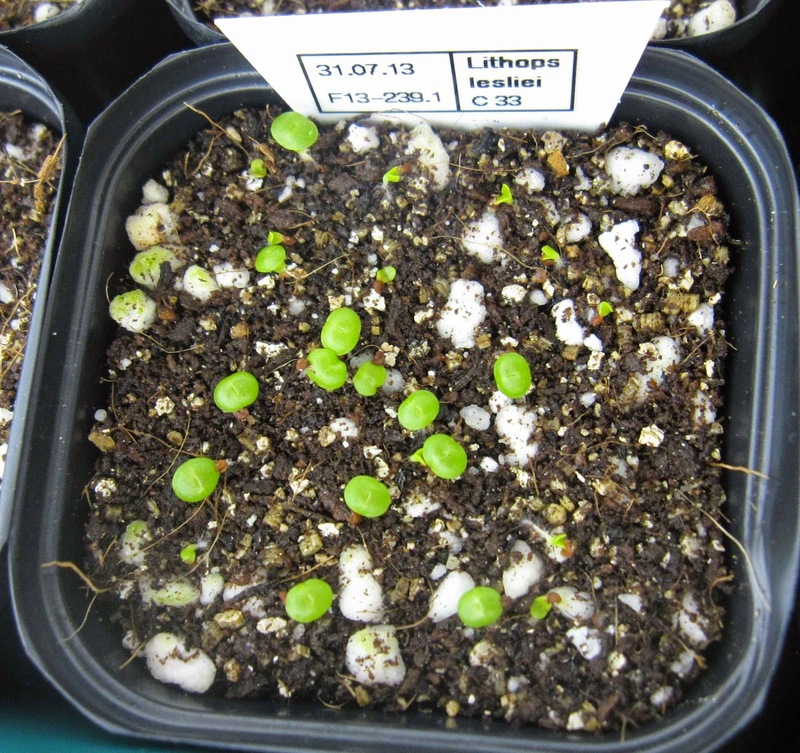 Lithops leslei germinating well one and a half weeks after sowing. point the pots are no longer in an enclosed humid atmosphere. 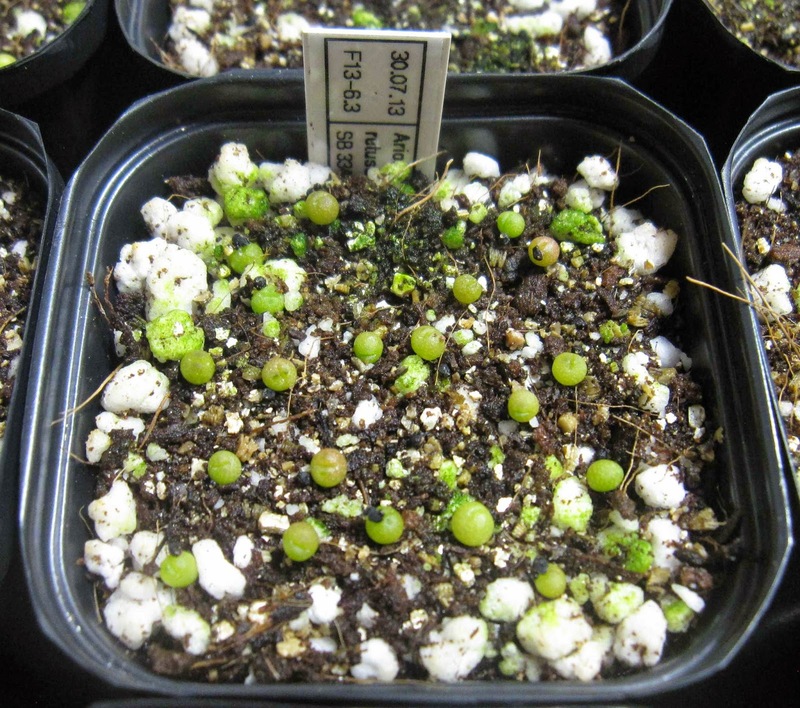 Members of the cactus subfamily Opuntioideae often have low germination rates and take long to germinate. Columnar cacti I have little experience sowing so I will not comment on them. 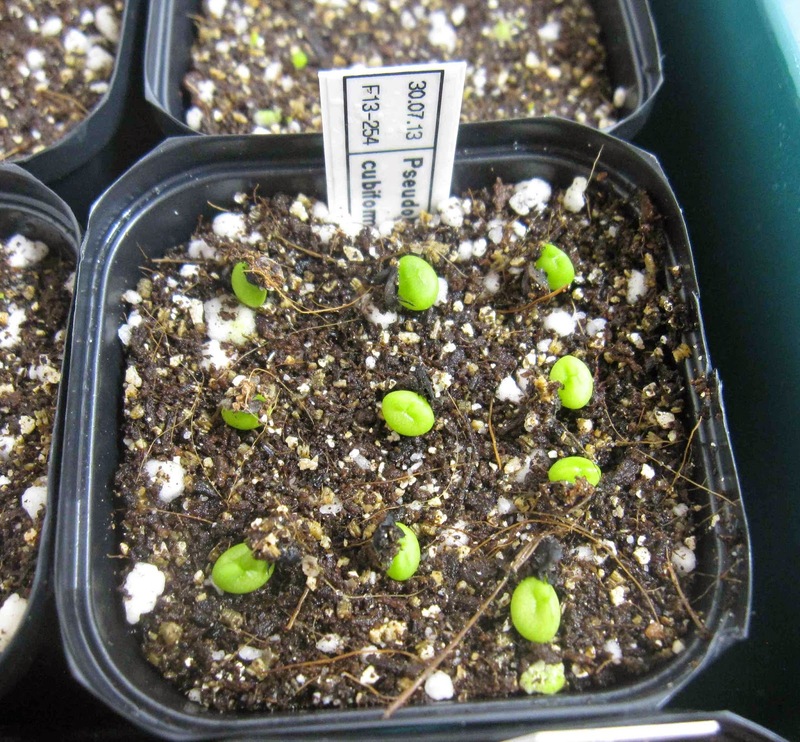 Most globular cacti germinate well but, again, the bigger-seeded species tend to germinate with some difficulty. Almost all species will germinate better the fresher the seeds are. Seeds from a few species sometimes need a maturation period though – I believe these to mainly be part of the Opuntioideae subfamily. That’s it for the germination bit. All in all it’s not a terribly difficult business. Some species are very challenging but most are fairly easy from seed. It takes a bit of practice to get it all right but it’s perfectly possible to start with a few seeds and sow them in a coffee mug placed on the window sill. As with most things it can be as complicated or simple as you want it to be. In any case it’s a lot of fun! This entry was posted in The Nursery by cactusglobe. Bookmark the permalink.